Flatbed Trucking has more than 100 years of combined experience in the flatbed industry. That is important and we use it to make a detailed and calculated decision when it comes to your freight. Finding a good service and a trustworthy source is hard to come by these days. We realize this and our highest priority is honesty and transparency with you, our clients. We at Flatbed Trucking have solutions for your freight loads. Get a quote for your next load. Give us a call and we’ll get you a quote in no time. 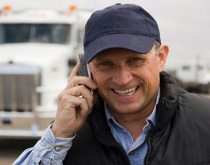 We maintain a $250,000 insurance policy that supplements the existing “motor carrier insurance” that truckers are required to have. Beyond that, cargo insurance is also available for any amount of value that calculated on your shipment. Now that’s putting the customer first. If you have a shipment that needs to be shipped outside of the country, don’t worry! We are accredited to ship both to Mexico and Canada, as well as in the United States. If your business or personal needs require you to ship out of country, then you’ve come to the right place. With over 100 years of experience in the flatbed trucking industry, our team of experts at Flatbed Trucking™ can handle anything you need.